The Lady Panthers are in the top ten in two major polls. 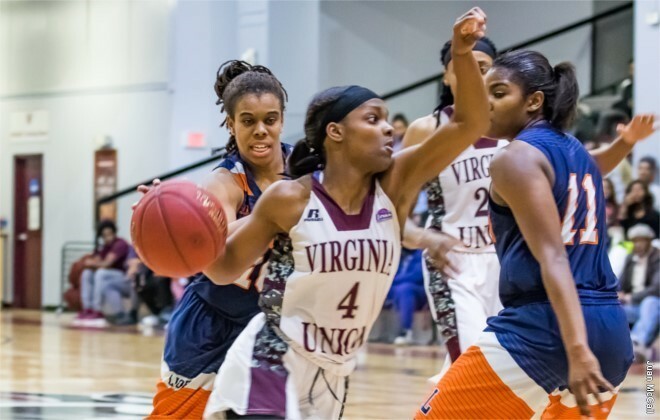 The Virginia Union women’s basketball team is currently ranked in the top ten in both the WBCA and D2SIDA polls. On Tuesday the Lady Panthers (6-0) moved up three spots to No. 9 in the WBCA and two spots to No. 6 in the D2SIDA poll. Virginia Union is coming off of a three-game sweep at the Nova Southeastern University Thanksgiving Classic this past weekend in Florida. The Lady Panthers defeated Palm Beach Atlantic University, Nova Southeastern, and Barry. VUU has four players averaging double figures, led by Shareka McNeill who’s chipping in over 22 points per game. The defending CIAA Champions are off to a fast 6-0 start and are the only team in the league yet to lose a game. VUU has shown itself to be the road warriors of the conference already, with three more road games remaining until it finishes an entire month away from Richmond. The Lady Panthers will be in Winston-Salem, NC this weekend for games against Bluefield State and Benedict in the WSSU Red-White Classic.